Melisande is a Breton witch that lives in Drakelowe. 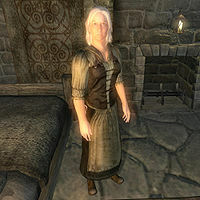 She is rumored to be one of the last witches of Glenmoril, a coven renowned for their ability to cure vampirism. She usually never leaves Drakelowe, doing only two things: sleeping from 2am to 9am and pacing around her home at any other time. However, during the Vampire Cure quest, once you have delivered all the necessary ingredients, she spends the whole day in the basement, preparing two Cure Vampirism potions. Later in the quest she heads to Castle Skingrad and helps Janus Hassildor revive his wife Rona. Once the quest is completed, she returns to Drakelowe and resumes her daily routine. She wears a shirt with suspenders with breeches and clogs and also carries a small amount of gold. In combat she relies on spells from all magic schools, especially Destruction and Mysticism. Unless you accidentally stumbled upon Drakelowe prior to the related quest, you will hear about Melisande from no other than Count Janus Hassildor, when you ask him about a cure for vampirism. After revealing the sad story about his wife, he will reveal what he knows and task you: "What little I have discovered points to the witches of Glenmoril. In the past, they have been capable of creating a cure. I have searched for these witches throughout Cyrodiil, but no covens still exist within its borders. There may be one left. I have unconfirmed reports of a woman seen near the Corbolo river who fits the description of these witches. Seek her out, and learn whether she can help. 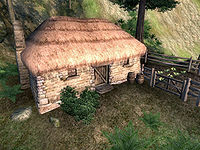 She lives somewhere along the river, east of the Imperial City and south of Cheydinhal. If you are successful in finding a cure, report to my steward. You have my thanks." When approached inside her cabin, Melisande will be quite surprised to see a stranger: "What brings you to this neck of the woods, sir/my lady?" When you ask her for a cure for vampirism, she will be puzzled: "Oh my! What makes you think I would know about such a thing?" Two options are available: either tell her you heard about her or confront her directly. The former will make her say: "My dear, you shouldn't trust rumors. They can get you into horrible trouble. This time, however, you've heard correctly. I might know a thing or two about it. But I'm afraid the information isn't free. You do me a small favor, and then we'll talk about this cure you seek." If you confront her directly, she will respond: "Oh, my dear! I gave up witchcraft a long, long time ago. But a cure for vampirism... That's something I haven't thought about in quite some time. Very challenging, and potentially dangerous. If you do a little something for me, I'll help you. How does that sound?" If you choose to reject her offer, she will just say: "Very well. I imagine if you're so interested in the cure, it's urgent... and perhaps personal? I shall be here if you change your mind." If you accept, she will explain what needs to be done first in a long list of tasks: "I have my own interests, and they occasionally require resources that are difficult for me to acquire. Soul gems, for example. If you can bring me five empty Grand Soul Gems, I'm quite sure I can help you with this cure that you seek. I shall await your return." Asking her about a cure at this point will net you: "Bring me the Soul Gems I've asked for, and then we'll discuss a cure." She will rush you out of the house when you exit the conversation, regardless of your condition. She will consequently start to greet you with: "Good to see you again. Do you have the Soul Gems I requested?" If you return to her without the Gems, she will respond: "Oh, dear. That's a shame. I was so looking forward to helping you. Well, there's still time, is there not? I shall continue to wait." When you have acquired the requested amount of Grand Soul Gems, Melisande will remove them from your inventory and present you with a slew of ingredients for you to gather: "Ah, wonderful! These will be most useful to me. Now, to the matter at hand. You need a cure for vampirism, yes? I believe I can create a potion that will do the trick. But it requires a few things. To start, I'll need six cloves of garlic, two shoots of Bloodgrass, and five leaves of Nightshade. Those will be easy enough for you to find. But I'll also need the blood of an Argonian, and the ashes of a powerful vampire. Those may be... more difficult for you to acquire. Any old Argonian will do, but the vampire must be very powerful indeed. If you succeed, I'll get you what you need. Any questions?" She will then hand you an enchanted dagger to gather the Argonian blood. Asking her about a cure now will make her repeat: "Once I have all the ingredients I need, I'll fashion a cure for you. This is a delicate matter, and cannot be rushed." Additionally, you can ask her questions about the specific ingredient. You can also deliver them one by one and get a response. "This one is... difficult. It may be quite a trial for you. But if you are successful, it will make the cure all the more worth it. You have come across a vampire or two in your travels, perhaps? I assure you, they are nothing like what you must face. The vampire you seek is powerful, so powerful that those who sought to destroy him were unsuccessful, no matter what they tried. The best they could do to was to imprison him underground, where he survives to this day. Search near the North Panther River for Hindaril. If you can vanquish him, his ashes will be more than adequate for my needs." "Well, well. It would seem you've been busy out on your own. I need the ashes of a powerful vampire. You have them in your possession. It is good to see that Hindaril has been defeated already." "You haven't used it yet, have you? Don't be hesitant. This is the only way." "I'll just take that dagger back from you. It should have more than enough blood for my needs. I do hope it didn't cause too much trouble." "A most interesting plant. From the planes of Oblivion itself, so it may require some effort to find. Should your travels happen to take you to a place where it grows, keep your eyes open." "Ah, excellent. I hope getting it wasn't too much trouble for you." "Perhaps not quite as easy to find as garlic, but if you're determined, you'll find it. Keep your eyes open, as it often grows in the wild." "Wonderful. I do hope you didn't try to eat any of it. It can have very nasty effects on one such as yourself." "You're familiar with it, aren't you? Often used in cooking. It should be quite easy to find." "Six cloves, just like I asked for. Very good." When you have delivered all the ingredients, Melisande will be satisfied: "I have everything I need. Now all that remains is to brew the potion. This, however, is a task with which you cannot assist. Give me twenty-four hours. I shall have the potion ready for you then." The inhospitable witch will then head into her basement, where she will greet you with: "Now is not the time for talk. I have work to attend to." and go to work until the start of a new day. Shortly after midnight she will return to the main room where she will finally have good news: "Welcome, welcome! I have something for you...." When asked specifically she will tell you: "The cure you seek is ready! I'm quite pleased with the results. The batch came out larger than I'd expected; there is enough for two doses of the potion. Unless I'm mistaken, I believe this dose is promised to someone. Should you ever have need of another, for... personal reasons, I can provide it. Our work here is done. You should be on your way." Eager to get you out of her cabin, she will only say: "You already have the cure. Shouldn't you be delivering that somewhere?" Once you return to Castle Skingrad with the cure in hand, Hal-Liurz will lead you to the Chamber of the Lost, where you will find Janus Hassildor seated in front of his wife Rona. Melisande will be standing next to the bed, ready to help for the last time. If you talk to her she will ask you to remain silent: "Now's not the time, little one. The Count has been waiting for you." When you approach the Count, he will say: "Time grows short. The cure must be administered as soon as possible. Please, hand it over. Melisande has agreed to help revive Rona long enough for her to drink the potion, and finally be at peace. If you are quiet, you may remain. Now, stand aside." Melisande will then say "I can bring her around for a short time. You must be quick." and revive Rona, and Janus will have one final conversation with his wife before she drinks the potion and is freed from her suffering. Talking to Melisande at this point will make her say: "Hush, child. This is serious." After Janus' request for a 24 hour mourning period, Melisande will return to her lonely existence in Drakelowe. Bloodmoon players may recognize the Glenmoril witches from a similar quest: Rite of the Wolf Giver, where they helped you cure yourself of lycanthropy. Due to a minor error in scripting, Melisande will always be surprised when you hand her the Ashes of Hindaril, as if you killed him before the quest. This means that the dialogue: "Hindaril is destroyed? You are indeed a force to be reckoned with. I shall take the ashes; finally, some part of him can be put to a good use." is never used. Esta página foi modificada pela última vez à(s) 21h50min de 16 de março de 2016.